San Diego recently became one of the largest cities in the country to commit to the goal of 100 percent clean electricity city-wide. It’s just one part of a climate action plan that aims to cut the entire city’s global warming pollution over the next 18 years to half its 2010 levels. The plan also sets targets to electrify all city vehicles, divert waste from landfills, reduce water use, and increase the use of bikes and mass transit. It’s a big goal. That’s Cody Hooven, chief sustainability officer for the city. With a Republican mayor and a population that leans conservative, San Diego might not seem like the most likely place for aggressive action on climate change. But Hooven says that the plan has wide bipartisan support. She says that the solar and wind power industries will create an employment boom, including jobs for people who may not have advanced skills or a college degree. And when a plan to help the climate helps the local economy as well, it’s easier to get people on board. 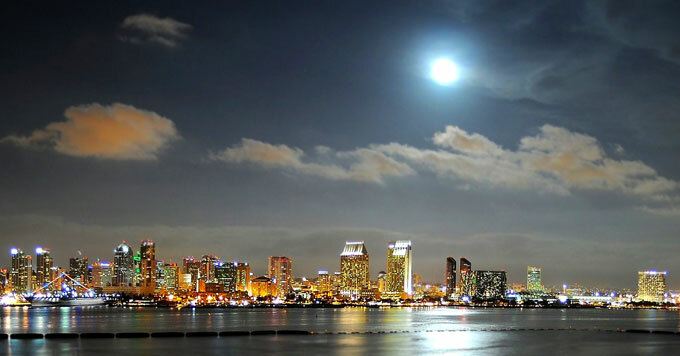 Photo: San Diego night skyline.